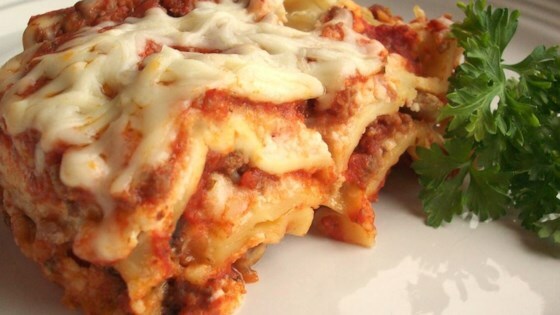 "A traditional lasagna, with about half the time and effort! I always cook extra to have leftovers, but the more I cook, the more they eat! Serve with garlic toast and salad." Brown the ground beef and Italian sausage in a large skillet over medium-high heat. Drain excess grease. Stir in the water and black olives, and season with basil, garlic powder, oregano, sage, pepper, minced garlic, and onion flakes. Simmer for about 15 minutes, stirring frequently. Stir in the marinara sauce, and remove from the heat. Place a layer of the meat and sauce in the bottom of a 9x13 inch baking dish. Cover with a layer of dry noodles. Spread a thin layer of ricotta cheese over the noodles, and sprinkle with a little mozzarella cheese. Cover with another layer of sauce, and repeat layering ending with the meat and sauce on top. Reserve about 1/2 cup of mozzarella cheese for later. Bake for 45 minutes in the preheated oven, but check after 30 minutes depending on how thick the lasagna is. Lasagna is cooked when you can easily stick a knife into it. Sprinkle the reserved cheese over the top, and return to the oven for about 10 minutes for a nice melted cheese topping. haven't used this recipe but I have been using dry noodles in my lasagna for years now. You don't need to buy the "new no cook noodles" the old ones work just fine. I doubled the sauce, used 1 1/2 cartons of ricotta chees and made it in a deep lasagna pan. My husband thinks it's better than my grandmother's from scratch recipe. This was my first attempt at lasagna and I definitely will make it again! The Italian sausage really gives it zing. Also, it makes it less intimidating cooking the noodles right in the pan.